Writing about pubs? Yeah, I can do that. 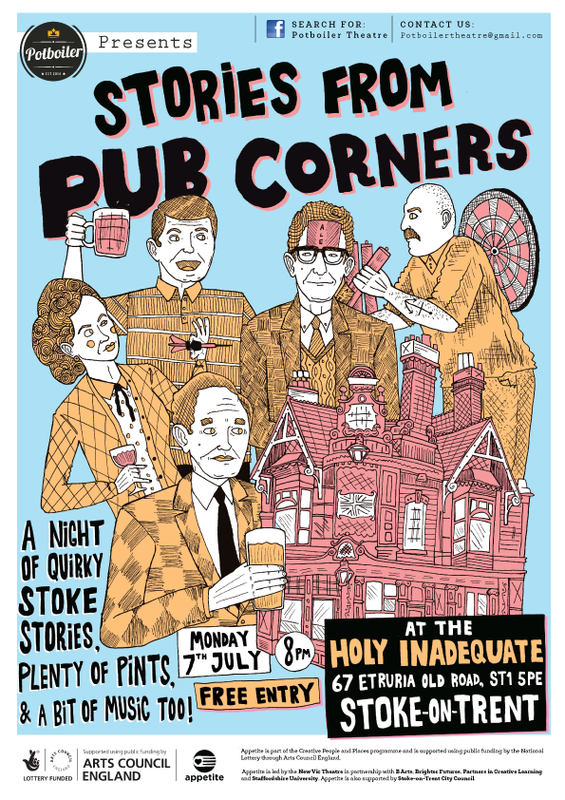 This week I was delighted to watch a performance by the fledgling Potboiler Theatre group of ‘Stories from Pub Corners’ – a collection of six monologues performed in situ at the ‘Holy Inadequate’ real-ale pub in Etruria, Stoke on Trent (best pub name ever?). I have to declare an interest here as I had written one of the monologues. I first came across the call-out for writers with ‘experience of pub stories’ to come forwards and send a draft script to be considered a few months ago. ‘That’s me’ I thought, ‘I’m a writer, and I’ve been to like, loads of pubs – I even used to live in one!’. So I applied, naturally. As a writer you tend to often find yourself isolated. That’s not a bad thing, it’s obviously easier to write somewhere quiet without interruptions, but it does mean that getting out and collaborating when the opportunity presents itself is usually a very good idea. This particular production started (for me) with an initial meeting with the producer/lead writer following my submission of a draft piece based on some brief character outlines. A week or so later I met the full team of actors, the director, the other writers and the musician when we came together to introduce ourselves, talk about our experiences with pubs, get some ideas flowing and workshop characters. I got to see a section of my early draft acted out, which was a first for me and a very valuable experience that I hope to have again (I’ve heard my work acted out before on radio, or even acted it myself vocally – but this was my first live, in-the-room type workshop for a visual performance of my work). I was struck by just how well the actors brought the characters to life off the page. You are always told as a writer to ‘read it aloud’ to yourself when writing scripts especially, but even so, not being trained actors, we can never quite know what to expect when it does fall into someone else’s hands and interpretation. I was more than impressed by what I saw. These guys were really good, and seeing them in action, even with extremely early draft pieces, really helped me to go away afterwards and keep the performance in mind when writing the next draft. And to top it off – we all went to the pub after the meeting to see the space (and drink some pints). After that it was back to the office to write a new draft for a new character outline before a further script reading (at the pub), the next week. This is where the fun, and challenge, of redrafting comes in. Originally I had written for a character in her forties, but due to the actors we had available, she had to be replaced with a younger character. So, I got given the brief of ‘Mad Lee’ – a young lad with a story to tell about the crazy night he is still recovering from, having woken up in bed with an unusual keepsake. At the script meeting, myself and the other writers read through and discussed our draft pieces. Again the value of this approach was soon obvious. Having other writers give you honest and constructive feedback in the development stages can really help you to sit back from what you’ve written and sharpen it up. It’s all too easy in any project not to see for looking. Fresh eyes and ears are very helpful indeed. As it happened, due to what I will call prop-acquisition uncertainty, a certain central premise of my draft needed to be changed, quite dramatically! This meant I got to go away and once again rework the script. I was happy for this change. It forced me to once again go over it, consider the plot and the motivations of the character and further try to judge how the audience would react. After that, the final-ish draft of the script made its way to the group for rehearsals (which I couldn’t attend thanks to a pretty gruelling gig schedule that weekend for my other life playing original music) – so it was only at the first performance I was able to get along to see my character come to life. And what a life! The nature of this project is that the action takes place in a pub, amongst the audience, as if the characters are just another punter who suddenly decides to pipe up. This was often signalled by the great use of a musician who would start to play a related theme on a guitar prior to the monologue, sometimes dropping back in to add tension or comedy touches to pertinent sections and tying together the evening. I won’t go into details of the monologues in case of any future performances, but I will say that as an audience member, it was a unique experience. Sometimes the characters were sitting right opposite me and it felt like being in intimate conversation. Sometimes they were across the room, and I felt voyeuristic, as if listening in to a particularly interesting discourse in a public space. For the last two characters, I was stood up, watching the performance though the curvature of the ornamental wood carved screens, as if framing my own director’s cut. And everyone else in and around that room was getting their own unique perspective, able not only to see the actors performance, but the reactions of the other audience members in contrast to the ‘eyes forward’ of traditional theatre. The nerves of waiting to see my own character perform dissipated as soon as he started speaking and I recognised him (not just the actor playing him, the character himself). There he was, sitting a few feet away from me, alive, telling and owning his story independently of me, like some weird fully grown man-child I had contributed to bringing into this world for a short time: flying the coup. Needles to say, the rest of the monologues were fantastically written and performed, and the evening was by all accounts a big success. If you hear the name ‘Potboiler Theatre’ in the future, come along. If this is anything to go by, you are sure to be in for a treat.